This layout demonstrates how colour blocking combined with a strong choice of colour and some cute stickers is an effective way of creating a border for your page. 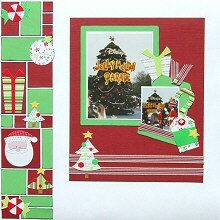 This layout was created using White, Red and Green Bazzil cardstock, white cardstock, dark brown or black ink pad, red and white striped ribbon, light green square brads and Doodlebug Cheerfully Christmas Icons stickers. Lightly ink the edges of all your green and red pieces with dark brown or black ink. When dry, arrange on your White Bazzil cardstock background as shown in the layout above. The gap between each piece should be approximately 2mm. Select the stickers you would like to use on your border and arrange as shown in the layout above. I have used two candies, an ornament, a gift, two Christmas trees and a Santa Claus sticker from Doodlebug's Cheerfully Christmas Icons stickers. Now that your border is complete, it is time to move on to the main features of your page - your photos. Crop your photos and then mat with white cardstock so each one has a thin white frame. Mat your larger photo again on Green Bazzil cardstock, creating a border 8-10mm thick around your photo. Lightly ink the edges with dark brown or black ink and set aside to dry. Next, cut a large rectangle of Red Bazzil cardstock measuring approximately 18.5cm by 22.5cm. Lightly ink the edges with dark brown or black ink and allow it to dry. Adhere your large photo in the top left-hand corner of your red rectangle, as shown in the layout above. Cut a tag from Green Bazzil cardstock and lightly ink the edges with dark brown or black ink. Allow it to dry. Cut a piece of red and white striped ribbon and attach to the top of your tag using a light green square brad. Adhere your small photo to the tag. Angle it so that it overhangs the left side of your tag. Tuck a candy cane sticker behind your photo so that the bottom of the candy cane is underneath your photo and the top is overlapping your photo (see layout above for exact positioning). Wrap a piece of red and white striped ribbon across the bottom of your tag. It should overlap the bottom left corner of your photo. It is now time to adhere your tag to your red rectangle. Angle it so your small photo ends up straight (like your large photo). Tuck a Christmas gift in behind the top left-hand corner, as shown in the layout above. Position your Cheerfully Christmas tag sticker toward the bottom of your tag. Angle it outwards, as shown in the layout above. Place another light green square brad in the centre of the red circle on your tag sticker. Finally, place a yellow star sticker on your tag sticker. Cut two more pieces of red and white striped ribbon and adhere them across the bottom of your red rectangle, leaving a small space in between. See layout above for exact positioning. Place a Christmas tree sticker on top of the ribbons in the bottom left-hand corner. Finally, adhere your red rectangle to your background page. Centre it vertically but position it more towards the top of your page. This leaves room along the bottom of your layout should you wish to add a title.